Our herbs and plants thrive on unique cultivation areas that we find primarily in the heart of Switzerland. The Entlebuch and Napf regions are located almost on Dr.Dünner’s doorstep in central Switzerland. 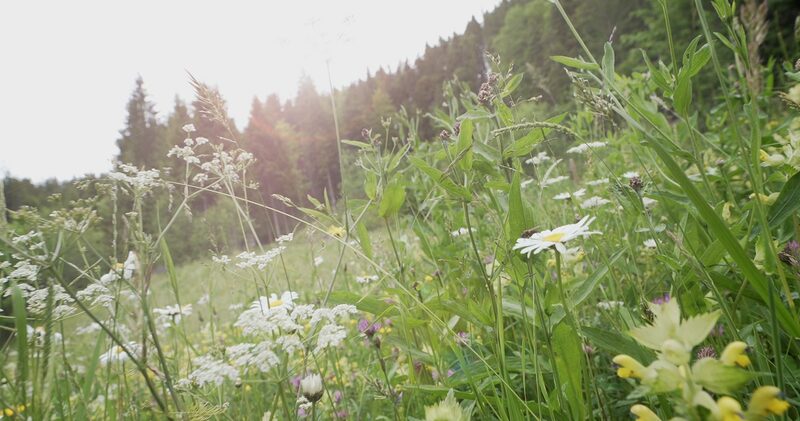 The ecologically valuable growing area of the “Biosphere Entlebuch” lies far away from industry and traffic so flowers, herbs and organic milk sheep do not come in contact with pollutants and remain pure and powerful. Numerous experienced herb farmers cultivate the plants with great dedication and a lot of passion. Since each plant has individual needs for healthy growth, cultivation is optimally adapted to the various climate zones, locations and soil conditions: Rather acidic soils and relatively high precipitation create ideal conditions in the Emmental for growing peppermint. In the Jura grows the beautiful, up to three-foot high yellow gentian, which loves limestone-rich soils and is harvested by well-trained collectors. The Hofstetter family is linked to Dr.Dünner by an intensive partnership. The family of seven maintains its farm in Switzerland’s only UNESCO Biosphere with a lot of dedication. Organic farmer Peter Hofstetter lives with his wife Heidi on the 500-year-old farm of Widmen in Entlebuch. Against the picturesque backdrop of green hills and mountains, the family has created a small paradise with sheep and organic plants. They have been married for 26 years and are parents of five sons. The idea for the Dr.Dünner mobility ointment with sheep’s butter was contributed by Heidi and Peter Hofstetter – because on their farm, everything revolves primarly around sheep: 240 animals of the “Lacaune” breed characterize the family’s daily life. Sheep’s milk has many positive properties – some of them suitable for use by Dr.Dünner: The fat molecules of sheep’s milk have not only a fine and supple structure but also have a high content of 79% polyunsaturated fatty acids. This makes sheep’s milk an outstanding ointment base because it penetrates deep into the skin layers. In addition, natural sheep’s butter has a very pleasant smell. “For us, it was immediately clear that something valuable for our health could be done with it,” explains Heidi Hofstetter. Thus, the family – also thanks to the collaboration with Dr.Dünner – is a prime example for the UNESCO Biosphere, because in a biosphere it‘s mostly about the people who bring forth the best from the region and our health too, together and in harmony with nature. For more than 30 years, the Theiler family has farmed a 13.5-hectare (33-acre) organic farm in Hergiswil. To cultivate the plants and herbs, which include elder, mallow, peppermint and sage, there is an area of more than 2.5 hectares (6 acres) on 715 m (2346 ft) above sea level available. “All the plants and herbs we cultivate have a positive property, which is why we especially cultivate these beneficial plants. Our organic cultivation requires a lot of manual work,” explains Martin Theiler. The Theilers always harvest the medicinal herbs in the early afternoon when the essential oil content is highest. Then they are placed in the drying room where a heat pump heats up the air from 20 °C (68 °F) to body temperature in order to preserve the power of the herbs. “A high-quality product is the result of organic cultivation, care, manual harvesting and removal of the stems. Our customers also wish this,” explains Theiler. Even the elder growing on the edge of the field means manual work for the Theilers, as elder is not picked, but ideally cut. The optimal time is in the morning during a dry, sunny period when the dew has evaporated. The best collecting container is a basket so the flowers can lie loosely and airy inside it. Elder has been used since the Middle Ages for infections of the upper respiratory tract. The flowers are still appreciated today as sweat-inducing agents in colds. Dr.Dünner gladly falls back on the elder of the Theiler family because it uses the plant for two natural remedies: For the “nasturtium, rose hips, elder and vitamin C capsules” and for the “linden flower, elderflower, thyme and vitamin C juice.” Both natural remedies support the immune system. In the spring, when the last snow has melted, the herb farmers put the delicate young herbs outside. The planting of the seedlings requires accuracy and dedication. The utmost caution is necessary here in order not to lose the harvest by sudden cold snaps. Many days or even months of hard work would then be quickly in vain, endangering the production of Dr.Dünner’s natural remedies. Weeding also takes a lot of time and effort. Many farms have only small cultivation areas where the use of machines is partially not possible, so manual work is demanded. It is also decisively advantageous because pests are quickly identified so chemical pesticides can be dispensed with. All that effort also pays off owing to the high quality of the harvest that our customers appreciate so much. By changing the field regularly, our farmers increase soil fertility, thereby ensuring a vigorous and healthy soil and plants. We rely on this natural method of herb cultivation and strictly reject artificial fertilizers so species diversity can also benefit from this. Dr.Dünner supports farmers who act in harmony with nature in their biological or natural herb cultivation. They harvest the plants only until they have reached their highest content of valuable substances. With certain flowers and fine herbs, even the time of the day when the harvest takes place plays a role. After the herbs are harvested, the gently dried plants come directly to Immensee, where Dr.Dünner is located. In this way, the short transport routes allow us to optimally preserve the substances. It is in Immensee where the various natural products that Dr.Dünner has been exporting to all the world since 1948 are manufactured. We take very precise steps in all of this. We can never risk endangering the valuable, irrecoverable harvest by improper execution. The herbs can only be harvested once a year. We also pay attention to insect infestation or bad weather, as both can endanger entire production lots. In quality control, we check once again thoroughly whether the delivered flowers and plant parts fulfil our high expectations. Only the best is good enough to withstand the strict eyes of our inspection team. Everything must be perfect so Dr.Dünner products can exceed our customers’ expectations. Dr.Dünner produces in Immensee applying an elaborate and gentle process. Attention is paid so the valuable substances are extracted as gently as possible from the delicate plant parts. A lot of time, patience and money were invested in this so maximum quality could be achieved with the latest technology. Using a so-called autoclave, processing at lower temperatures is possible than with conventional processing methods. This guarantees the best quality and preserves the valuable plant substances.